Youth Action Board member testifies to VT Legislators! Wow! What a day! Today was Homelessness Awareness Day at the statehouse, sponsored by the Vermont Affordable Housing Coalition and the Vermont Coalition to End Homelessness. 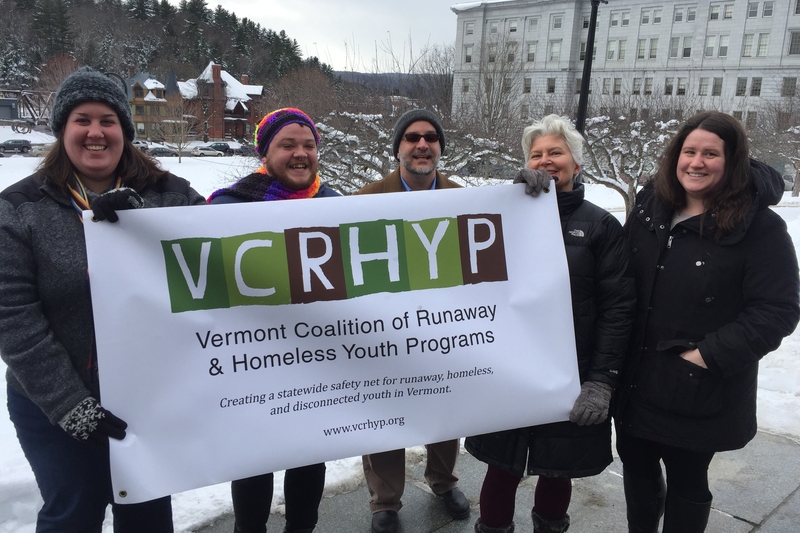 In the morning, a member of the Vermont Youth Homelessness Demonstration Program's Youth Action Board was asked to be part of a line up of agencies and individuals working to end homelessness. YAB Co-Chair, JR Burns, answered the call and shared his story and ideas to improving the systems of care with legislators. JR was so powerful! His comments were insightful and he delivered them with such vulnerability and honesty, many people were moved to tears. It's not often you have those moments at the statehouse, and it was special to witness. His full speech is below and I can't encourage you enough to read all the way through. · More resources for well-trained staff in housing programs who know how to address the unique needs of each youth and can help guide through the tough times and say “I’m here for you, through thick and thin.” It’s not an easy job, and making sure these workers are paid livable wages is important, because we need them to stick around. · Peer outreach workers to share information youth to youth. · Drop-in centers where we can feel comfortable and welcome and learn about and access resources, including educational and employment supports, food, and connections with peers. · Educational supports. Completing high school while being homeless was hard, but also critically important to my future. We need more alternatives and more support for homeless youth enrolled in school. · Lastly, I feel that Vermont could create a better safe space for LGBTQ youth. Discrimination on all levels, be they orientation related or racially related, needs to be stamped out." MANY thanks to JR for his work today, and over the past few months as Co-Chair of the Youth Action Board. Your voice is vital to our work! Hello, my names Ronald, but I prefer to be called JR, and I’m a part of the Vermont Youth Homelessness Demonstration Program's Youth Action Board. The Demo project is a 2-year initiative to increase capacity in Vermont to make youth homelessness rare, brief and one-time. The Youth Action Board is a committee of youth ages 16-25 with lived experiences advising the Demo project. In my experience of being homeless, I learned that youth homelessness is sadly happening far too often. Sometimes, depending on the situation, youth who are homeless or on the verge of experiencing it have the ability to get assistance either from the State or youth shelters/organizations that work specifically around housing homeless youth. However, there is a surprising amount of youth that are unaware of the assistance they could be getting and we need more resources for outreach. More outreach can help youth who need help identify where to get it, and help youth who are at-risk avoid homelessness by connecting to the resources they need earlier. For youth, peer-to-peer connections are the way we learn about things. We need to create more opportunities for youth peer outreach. I feel a youth-to-youth approach would create a better understanding of resources because it would be coming from another young person, for youth, to youth. I think Vermont could also help youth currently experiencing or at risk of homelessness by providing more drop-in or teen centers to give youth a place to feel comfortable and welcome and where they can learn about access resources, including educational and employment supports, food, and connections with peers. I was homeless for about a year before I was aware of some of the key resources that could help me, including emancipation and the McKinney-Vento Act. During that time, I was living in a homeless shelter in Maine and attending high school. It was my school guidance counselor who informed me of these resources a year into my experience. Let me repeat, I was informed by a school guidance counselor before the shelter specializing in serving Homeless Youth did. Not to talk ill of them, without them I wouldn’t be where I am today; but I say this to give a further example of how homeless or at risk youth can potentially not be well-informed in regards to the services that they could be receiving or how they could be helping themselves. We need more resources for well-trained staff in housing programs, and more cross training between service providers so youth get the information they need. I became homeless shortly after coming out as gay, and today with the support I received from Transitional Living Programs designed specifically for young people, I’m happy to say I’m going on 11 years of being a proud openly gay man. I’d like to thank them for housing me during my time of most need, but the best help I received was from staff helping me learn to not only love myself, but be proud in doing so. While I was gaining confidence in my sexuality, and myself, being homeless was still hard and stigmatizing and I didn’t want people to know. I found that the best way I could hide the fact that I was homeless was by always wearing a smile, regardless of the situation at hand. Always smiling in the face of adversity isn’t exactly the healthiest thing to do, but for some homeless or at-risk youth it’s the easiest thing to do because society has unfortunately made youth feel different for not having a home or not living with our parents or family. Or it has made us feel that if we’re homeless we are beggars. The harsh reality of this situation is that most youth are just trying to understand and accept what’s happening to them. For some this is too hard and they resort to self-harm or substances to make themselves feel better or make themselves believe that everything is okay. I would like to say that I’m not speaking from experience, but at 16 years old, homeless and unsupported, I felt that my life had lived up to its purpose and I was no longer wanted or needed, so I attempted to take my own life. I spent 2 days in the Crisis Unit in Lewiston Maine and was released back to the youth shelter I was currently living at. At that point, more than anything, I needed a friend on a professional level to help guide through the tough times. Youth really need to have someone there to say “I’m here for you, through thick and thin.” Someone that’s not a therapist; someone who they can relate to, and who can offer life perspective. Youth Housing staff are so important as they offer not just housing support, but whole life support. They have to be well-trained to do their work and can’t be too busy that they only have a little bit of time for meeting. They also need to be able to communicate on all levels because some youth have trauma or disabilities that make it hard to relate to others. It’s not an easy job, and making sure these workers are paid livable wages is important, because we need them to stick around. Housing systems also need to look at policies that may come off to service users as overbearing or strict. Granted in order to run an organization you have to have guidelines and rules set in place, but in order to help youth, you need to be talking WITH them, not at them and have enough flexibility to meet their needs, which will be different from person to person. In doing so, more times than not, people will achieve far more things in life in a far easier manner. Youth who are experiencing homelessness need more than housing. I feel that Vermont could be better with providing more educational and transportation options. I needed help with transportation to and from appointments, doctor visits, and therapy. Some, if not most, youth don’t have access to cars, or even bicycles, and live in places that are spread far apart. So shelters or appointments are out of walking distance. Sometimes local buses are too early or too late to make crucial appointments or curfews or even school hours, and nobody should be subjected to standing out in the dead middle of winter, or the heat of summer, for hours while they wait for the next bus. And education is key! Some youth have never finished high school, or are currently enrolled but don’t function to their fullest potential in public schools and need individual attention and education. I only know of 2 alternative schools in the area I’ve lived in for almost 14 years now, one being a GED program, and the other being the High School Completion Program I graduated from at the age of 24, which to break it down for you means I didn’t finish high school at a normal rate like others, I dropped out and graduated 6 years later. Completing high school while being homeless was hard, but also critically important to my future. We need more alternatives and more support for homeless youth enrolled in school. Lastly, I feel that Vermont could create a better safe space for LGBTQ youth. Discrimination on all levels, be they orientation related or racially related, still exists in Vermont and we need to create a place for those experiencing not only discrimination but potentially homelessness due to discrimination to not just feel, but also be safe and cared for. Thank you for your time and your support for preventing and ending homelessness for all people.